The League of Kitchens offers immersive culinary experiences, which connect curious foodies with immigrant cooks from around the world. Argentine, Bengali, Lebanese, Nepalese, and Uzbek (to name a handful) immigrants invite guests into their homes for intimate cooking workshops. Damira Inatullaeva was born in Samarkand, Uzbekistan. She refers to her hometown as, “The historic crossroads of east and west.” Samarkand lies on the ancient silk road. Damira considers her native Uzbekistan to be a very diverse county. Although she learned to cook from her mother and grandmother, her family had friends from many different backgrounds. Damira worked as a doctor until she was 55; the age at which retirement is mandatory in Uzbekistan. In 2013, with her children already living in the United States, she and her husband (Sahib) moved to Brooklyn, which has the largest population of Central Asian immigrants in the United States. Located in Southwest Brooklyn, Borough Park dates back to 1887. The mostly residential neighborhood is home to one of the largest Orthodox Jewish communities outside of Israel. Most businesses in the neighborhood close on Saturdays in observance of the Sabbath; including the chain stores. Someone once told Damira that if she can make it in New York, she can make it anywhere. 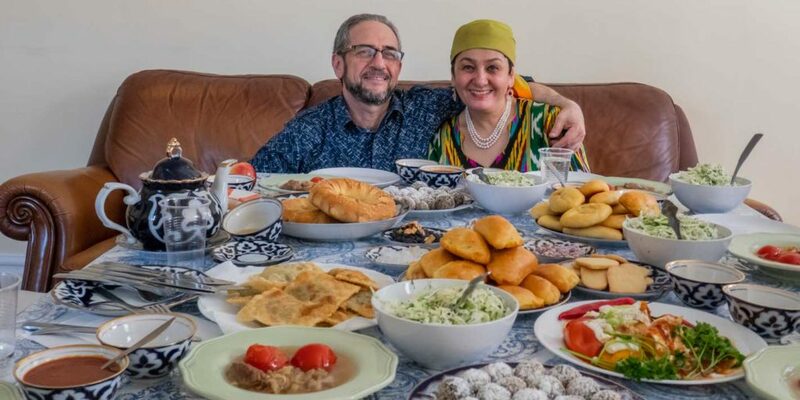 The League of Kitchens gives Damira the opportunity to do what she loves the most: hosting her friends and curious foodies from around the world for home cooked meals in the Borough Park apartment she shares with her husband, Sahib. Once everyone arrives, Damira serves tea, then hands an apple to the first volunteer who wants to introduce him or herself. Everyone takes turns passing the apple after condensing his or her life story into a concise one-minute memoir. Damira then talks about her life in Samarkand. After she steals the show with her impressive resume, the doctor-turned-chef gives everyone a quick overview of Uzbek food. The Chinese, Persians, Russians, and Turks have all left their respective marks on Uzbekistan. One thing that guests will likely remember for the rest of their natural lives: onions are paramount in Uzbek cooking! After introductions, everyone files into the nearby kitchen to prepare the first three of the six dishes of the day. Damira offers three different workshops, one of which is all vegetarian. While most of her cooking equipment will be recognizable to guests, she does use some unique Uzbek-syle pots and pans, which she enthusiastically shares the origins of. Even Brooklynites will likely be surprised at the plethora of stores she sources her goods from. After a relaxing lunch break (which is more like a dinner in terms of portion size), you head back into the kitchen to prepare the final three dishes, one of which is a dessert. During dinner, guests eat whatever they are able to fit while traditional Uzbek music plays softly in the background. Before cleanup, Sahib (Damira’s husband) presents an informative slideshow on their native Uzbekistan. There are a handful of Uzbek restaurants in Brooklyn. Even if you visit them all, you will not get the immersive experience offered by League of Kitchens. Other hosts from Asia as well as Europe, Latin America, and the Middle East also offer League of Kitchens workshops throughout Brooklyn and Queens.